It’s Chinese New Year, so what better way to celebrate than with spring rolls. Crispy and delightfully moorish, spring rolls are traditionally eaten during the lunar near year, or as it’s known in China, Spring Festival. There is no excuse not to indulge in spring rolls at this time of the year. It seems to be one of the first Chinese dishes to go mainstream in Australia and can be found in almost all Asian restaurants. Its so ubiquitous and loved, that the extremely Aussie chiko roll likely originated from this Chinese classic. Still, there’s nothing quite like home-made. There is no real secret to a good spring roll, you simply need fresh ingredients. 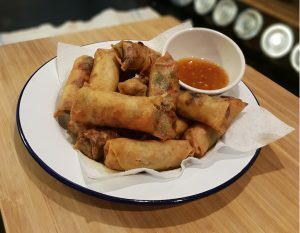 The recipe given below is a guide and as you gain more confidence in spring roll making, you may wish to choose your own ingredients and sauces as fillings. If you are making vegetarian versions, do not simply omit the meat, whose flavour will be noticeable missed. Instead, substitute the pork and prawns for something with robust umami taste, like shiitake mushrooms. The process of making spring rolls begins by frying the filling ingredients. The goal here isn’t to cook everything to oblivion, rather aim for vegetables that are slightly softened with a bare hint of rawness. You don’t want mushy carrots and cabbage! Once cooked, the recipe states to drain the mixture. While not absolutely essential, removing excess moisture will help to keep your spring rolls crunchier for longer. As with other Chinese snack foods like dumplings, folding spring rolls can be a challenge. But practise makes perfect and if you’ve ever folded an envelope, you can fold a spring roll. Simply lay the spring roll skin on a flat surface, load it up with filling, and then bring each corner of the skin into the centre. This pictorial guide should help. Mix together the pork mince, prawns, soy, sugar and cornflour in a bowl. Add the pork and prawn mixture, carrots and cabbage and cook for about 5 minutes, or until the meat is cooked and the vegetables have softened slightly. Turn off the heat and add the green part of the spring onion. Leave the mixture to cool and then drain the excess liquid using a colander or sieve. Roll the spring rolls! Place a wrapper on a flat surface and add 1-2 teaspoons of the cooled, drained mixture. Wet the edges of the wrapper with the whisked egg and then fold the spring rolls. Consult a diagrams for more detailed instructions. Heat the deep-frying oil in a sauce pan over medium heat until hot. Fry spring rolls in batches of 2-4, being careful not to overcrowd the pan. Cook for 2-3 minutes or until they have turned golden brown. Remove and drain on a paper towel before serving.